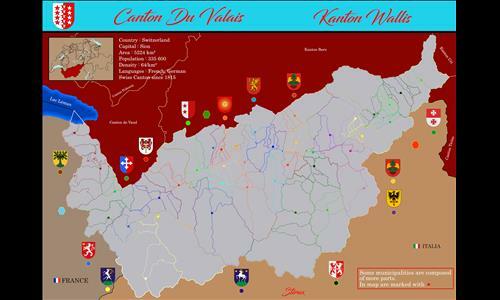 The Canton Du Valais in French, Kanton Wallis in German, is one of the 23 swiss cantons. It's a Canton since 1815. The capital city is Sion. Review by Nathan on 9/26/2016. Fun and very well-balanced. I applaud the mapmaker's use of red dots to show the discontinuous territories - this is a challenge anyone faces in trying to represent parts of Switzerland (and other regions, as well). I sincerely hope he finishes making a map of every canton. Review by Olkani [PG] on 11/11/2016. Review by warhawk on 1/2/2017. good small map. But only for an even 1vs1, 2-2, 3-3 ... Not good for a multi-player FFA. The detached territories really throws off the flow of the map, because they are all assigned the same symbol it is hard to distinguish what part goes to which territory just by sight.